Today is a red-letter day: my bandages came off! Don’t worry, I won’t scare you with the dopo-intervento (after surgery) photos. My doctor says it looks good despite heavy bruising. It was only 6 days ago I had the procedure — and 6 very long days in bandages taking sponge baths. Now I feel free-as-bird without all that added bulk, and I can go back to walking 7km per day. I cannot adequately describe the positive experience this has been and how pleased I am at the outcome. My legs are a mess now, but already the pain I was experiencing is non-existent. I credit my doctor for making the whole process easy. I had confidence in him from the minute I met him. As you know from my previous post, the hospital was excellent. While there were “moments” for me traversing this landscape with my limited Italian, I am glad I put myself out there and got the problem addressed. And I am oh-so-glad that many of you had a belly laugh at my expense. A few people have approached me and said “I need to get that done.” Ladies, do it! Wear the doggone compression stockings and get the problem addressed. Maybe you can do a medical vacation and have it done in Rome. 🙂 I can make a referral. Today is Halloween, which is not really celebrated here. There were a couple of parties last weekend, but this time of year is really about the religious holiday of All Saints’ Day. So tomorrow, we have the day off. We get the Italian and the American holidays off, which means November is truly blessed: 1 Italian and 2 American holidays. I believe the count is 6 extra holidays for us in 2013. Just to make my American colleagues feel better, if an Italian holiday falls on a Saturday or a Sunday, we do not get the corresponding Friday or Monday off. We have no Butterfingers or Snickers tonight, and no cute kids in costume, but there is a nice primativo open and some dark chocolate around here somewhere. My friends also know I used to decorate the yard for Halloween, and my office was decked out the past few years as well. In celebration of getting my bandages off, and in honoring the day, here is my decoration for tonight. Happy Halloween! 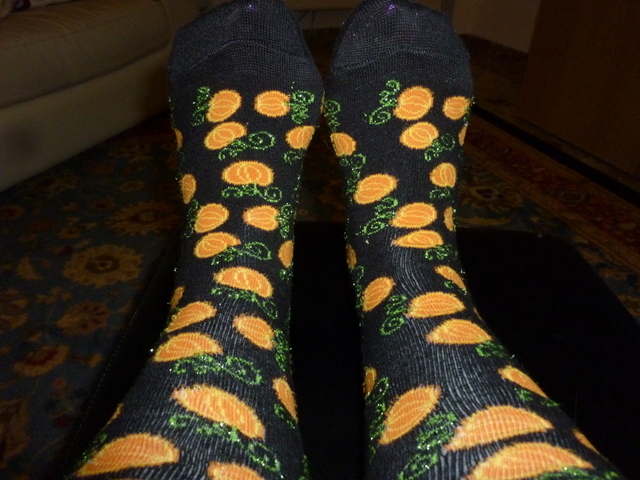 The mummy bandages from last week have been replaced by my Halloween pumpkin socks. 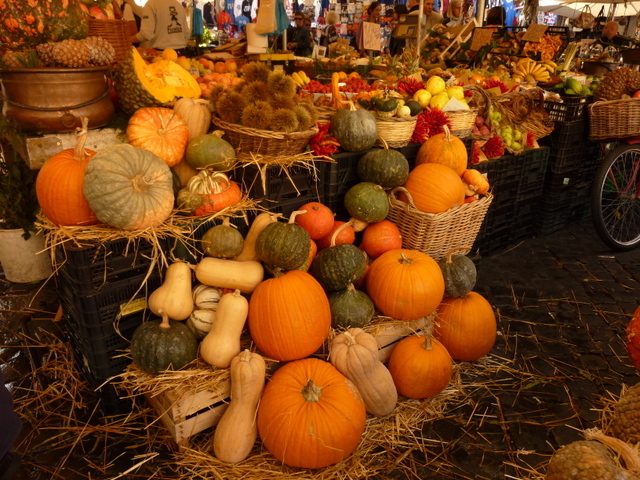 Bonus photo: Scene at Campo dei Fiori last weekend. Just like the Portland Farmers’ Market, but with better espresso. I do miss the Santa Rosa Burritos, though. Can someone ship one here? The market is wonderful Carolyn. Come over to visit and we’ll take you there! Love you too! Wonderful! Although your toes were cute, I’m glad to know you are free of bandages and can enjoy a long soothing shower or bath! That’s always my favorirte after the bandage stage! Ciao, Bella! Amen Sister! Long hot shower tonight, and a wonderful cream to reduce bruising. Wish I’d known about this stuff years ago since I bruise so easily. My toes, *sotto i calzettoni, *are still cute. Glad you are mending !! I thought about you and your doctor experience the other day. A lady was charged and extra $50 for asking her doctor too many questions during an office visit!! Incredible!! *Ciao Sharon! * No extra charges so far for me. I have never met such patient professionals. I have a lovely set of photos of my legs intheir bruised state,, but those are not hitting the Internet!